We arrived at Bangkok airport with no clue as to where to go but after consulting the Lonely Planet guide we decided to head for Koah San Road (travellers centre of Bangkok). We got a bus from the airport which was easy. We went to have a look at the D & D Inn and were pleasantly surpriced at the price, cleanliness and hot shower! They also had a roof-top pool that was open until 2am. We stayed for 2 nights and made plans for our onward journey. To be honest 2 nights is enough in Koah San as bars and restaurants are much the same. Gullivers bar was good as you got free internet access there too. Also Shamrock bar had a live band who were good. 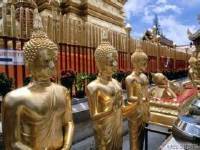 If you had more time, there are sight seeing tours to buddhist temples etc. But after India and Nepal we've had enough of religious monuments for a while now. Anyway, bad traffic here again so I can't imagine you would see much in a day!